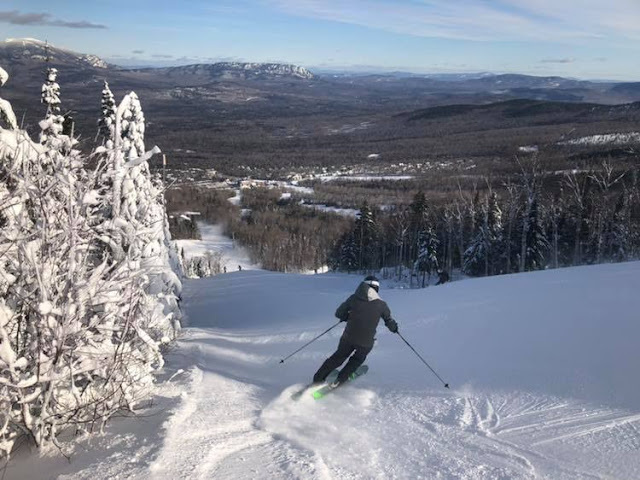 We have been very fortunate this year with the start to the ski season in Maine and New England. Many areas have received generous amounts of early-season snowfall and the temperatures have been very favorable for snow making... and that forecast looks good too! Between all of the @MaineSportsFam crew we have over 9 ski days under our belts. Early season at Sunday River as been fun. The Rivah did a fantastic job getting the mountain open early as they do every year and provided some fun early season turns. Then we really had a great day at Sugarloaf on November 18th. They have been able to rapidly open terrain off the Superquad lift. Blue and Black Cruisers Kings Landing, Hayburner, Tote Road and Candyside were groomed and skied very well, and a bunch of natural terrain was open too. Even though it has been skied hard the cold temps and deep cover is holding up well. We had our early season legs so we tired quickly... but we certainly enjoyed ourselves. This is shaping up to be one of the best Thanksgiving holiday skiing periods... EVAH. We highly recommend getting out skiing an taking advantage of it! Here are a few pics from our Sugarloaf ski day. We wish you a blessed and peaceful Thanksgiving. Hayburner skied very well with plenty of soft snow on the sides. It was really hard to believe it was November 18. Looks like mid-winter. Towards the end of the day the winds died down and the snow making crystals created rainbows.